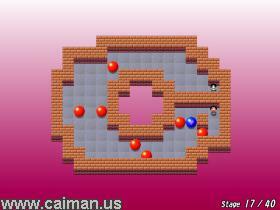 Caiman free games: Roll Ball for Win by Jed. In this great puzzle game a girl want to give her lovey-dovey heart to a boy. The gameplay let me think at some Sokoban like games such as Cassetto. But instead of pushing crates, you have to push some balls. Once you gave a ball a push, it will roll untill it hits a wall or another ball. - The lovey-dovey blue ball: That's the one that has to hit the boy. - A purple ball: A normal ball, but the girl cannot destroy it. When a red or purple ball is given to the boy they will dissappear. The game has 40 levels. 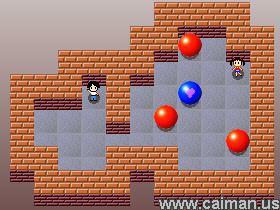 To complete a level you has to push the lovey-dovey blue ball to the boy. The first 20 levels are free accessable, but you have to complete them all before you can access the next 20 levels. The game automatically saves the game, so you haven't to worry about that. There is an in-game level editor too. In title screen, press F6 to start it up. Use the arrow keys to move over the playfield. Use the keys 1,2..9 to put an item. Shift+arrows = move the complete playfield. U, L = mirror everything. I really love this game. I think it's a must for the "Cassetto" fans! mirror download (no install - LZH) 497 kB. See our forum for some solutions .